Archduchess Valerie can be found here. 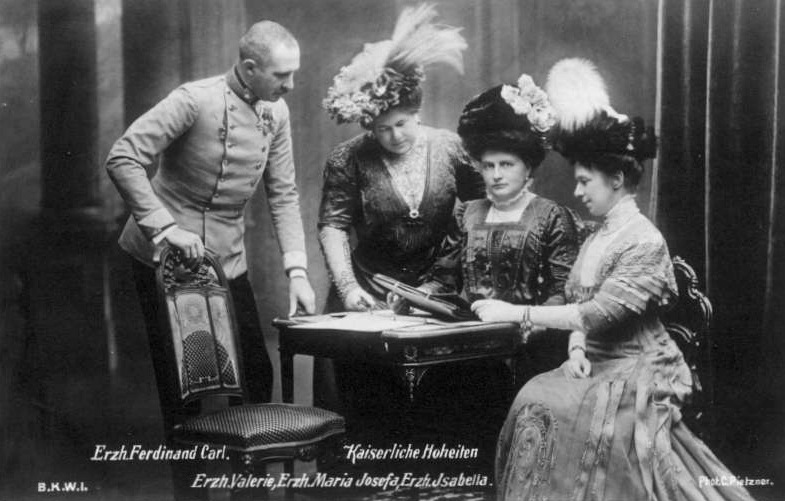 Archduchess Maria Josefa (from Saxony) married Archduke Otto Francis; her son Karl became the last Austrian Kaiser. Archduchess Isabella (from Croÿ) was married to Archduke Friedrich who commanded Austrian forces in World War I. Isabella hoped one of her daughters would marry Archduke Franz Ferdinand who instead sought her Lady-in-Waiting Sophie Chotek. She waged virtual war on Sophie Chotek and forced Franz Ferdinand and Sophie to marry morganatically. This left the way clear for Maria Josefa's son to briefly become Emperor when Franz Joseph I died in 1916 and the dissolution of the Austro-Hungarian Empire. Ferdinand Karl, like his older brother Franz Ferdinand, married morganatically. From Mrs. Fujita's photostream on flickr. This picture probably dates from about 1905 and it shows the Archduchesses wearing high ruff necks, straight/bouffant coiffures, and elaborate hats.